I’d been meaning to read this book for a while, partly because of the intriguing name, and partly because I remembered enjoying the movie Awakenings – based on a true story about the author, British neurologist Oliver Sacks, who “awakened” a bunch of catatonic patients through the use of a new drug (think Robert De Niro, sitting motionless in a chair, suddenly catching a ball thrown at his head). In ‘The Man Who Mistook His Wife for a Hat’ Oliver Sacks gives accounts of some of his most memorable patients. There’s the man who, obviously, mistook his wife for a hat (and tried to remove her head to place it on his own). There’s the guy who was mysteriously bestowed the improved senses of a dog and could identify a room full of people by smell alone. The poor man who believed his own leg was a dead person’s leg sewn on and kept chucking it out of bed (and wondering why he fell out of bed with it). The woman who had seizures and heard detailed renditions of the songs she’d only heard before immigrating as a baby. These are just a few of the many fascinating, yet often tragic stories. I found it hard to put this book down. Though non-fiction, the cases are often so far fetched it seemed like mad fantasy. It is not written condescendingly, however. Olive Sacks writes about each patient thoughtfully and compassionately. You feel you get to know the patients as people, not just as abnormalities of the mind. This book was written in 1985, so is bound to be medically out of date. But it does give insights into the human brain that I’d never really considered before. The human brain, apparently, has the capability to calculate 20 figure prime numbers within moments. Or keep a memory log of every conscious second. Or perceive colours and smells in wholly inhuman ways. This I just did not know. But instead of thinking, “hey wow, how can we all gain these skills?” I got the eerie feeling that there’s a fine yet necessary balance going on. The man who could smell like a dog no longer cared for abstract thought, he was too concerned with what he was experiencing in the present. The twins who could calculate immense prime numbers were so severely autistic they could barely function in the world. Maybe our limitations make living a “normal” life possible. And then there were those who didn’t gain any special skill but only suffered losses – the woman who could move her body through sheer mental will but could no longer know it as her own; the man who could see perfectly, but could no longer recognise what he was looking at; the woman who had to turn herself in circles to eat her dinner, eating right half of the plate at a time, because she’d lost the concept of left-ness. I totally recommend this book. It’s beautiful, sad, enchanting and definitely thought provoking. 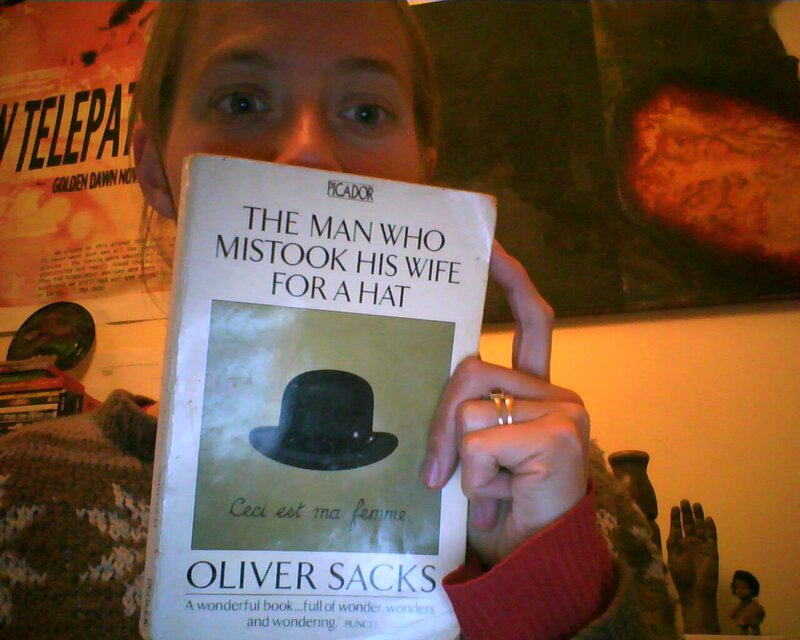 Hey Immi, loved your review of ‘The Man Who Mistook His Wife For a Hat’, I was just talking about this book in my psychology class today, thought I’d give this review a read and I am now really excited to read it myself! Lovely tie in with how our minds might need to be at this balance to function “normally” too. Thank you. “Hi” back! Awesome, glad you liked it. And yes, it’s definitely a worthwhile book to read, especially now I think, as a tribute to the author himself.